As this blog has discussed many times before, pirates stole not only gold and silver, but shipments of merchant goods as well. Of course, they chose the most valuable goods on a captured ship, and one of the most valuable trade goods was sugar. Trade with the Arabs brought the sweet stuff to Europe, but sugar did not grow well in the European climate. Demand for sugar was high, however, so Christopher Columbus carried cuttings of sugar cane with him on his second voyage. The plants flourished in the tropical climate of Hispaniola, and sugar became part of the Caribbean landscape. Sugar cane is a tall, grass-like plant that looks similar to bamboo. It has shallow roots, and long, flat green leaves with a serrated edge. During our time period, sugar cane was cultivated and harvested by hand, the harvesting done with machetes. The cane stalks were then stripped of their leaves and rough chopped, and the cane stalks were put into a mill. 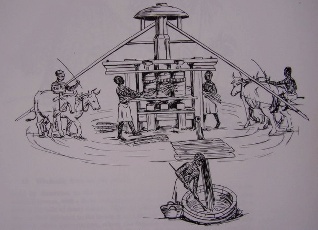 The mill used a stone wheel, driven either by harnessed animals or by slave labor, which crushed the stalks. This released the sweet sugar sap, which was drained, collected, refined and boiled until the water evaporated and it became crystallized sugar. Sugar refining has progressed over the years, and the product produced during the Golden Age of Piracy was a slightly sticky product, pale, but not as white as today’s sugar. Nevertheless, it was called “white gold” and quickly became the source of enormous profit. Today, the average American eats an average of 100 pounds of sugar a year. In 1700, the average was closer to 4 pounds per year. But this was very much stratified by income. A single pound of sugar cost as much a laborer made in two days. Archeologists can determine the income level of bodies from the early 1700’s by looking at the teeth. Sugar consumption meant that the bodies of the rich had badly decomposed teeth. Poor people (like pirates) had healthy, white teeth in comparison. The problem was that no sane person wanted to cultivate sugar cane. Because only the juice was used from the plant, vast fields were needed to produce a profit. Because heavy equipment was needed to extract the juice and refine it, it was a rich person’s game. And the work of growing and harvesting the cane was brutal. The tall cane stalks provided little shade for workers, while blocking any available breeze. Cane leaves were sharp on the edges, and cut the skin. The labor of cutting the stalks, stripping the leaves and carrying stalks to the grinder was exhausting. And the boiling kettles, often in the open under a tropical sun, produced killing temperatures. Small family farms simply could not do this. So, large plantations, powered by slaves, became the norm. Barbados was the most valuable colony in the English empire because of its sugar production, and as sugar spread, the slave society grew with it. 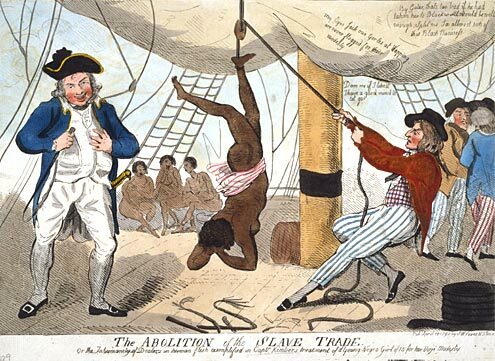 In the very early days, slaves were often Irish rebels, or poor British citizens, transported to the Caribbean because of minor crimes. But these people simply could not stand the heat and the sun. (Remember, sunblock would not be invented until 1936.) 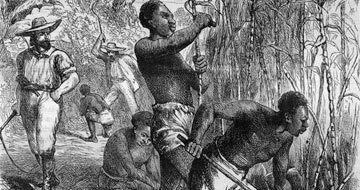 Plantation owners quickly switched to kidnapped Africans, who worked 18 hours a day in the cane fields. It is estimated that the average life expectancy of a slave in the cane field was two years. The plantation owners, surrounded and outnumbered by slaves, were constantly nervous. They feared slave uprisings, and demanded armed support from the government. This in turn supported the militarization of the English colonies. The slaves, meanwhile, worked to death, created horror stories in which dead slaves were raised to work on after they had been laid to rest. These “zombies” still permeate modern mythology. Sugar, as a luxury item, was also heavily taxed. England valued its sugar-producing colonies more than its mainland colonies because of the income they produced. It’s even been argued that England didn’t put its full effort behind fighting the American Revolution because they were busy defending Barbados from smugglers and pirates. Pirates probably ate the sugar that they captured, but recipes containing sugar were still somewhat rare. Cany usually consisted of seeds or small fruits dipped in sugar and dried. Sugar was consumed in tea and coffee. Jams and jellies – fruit preserved by sugar – was just becoming popular, but pirates probably didn’t have the means to create these, and would have just consumed any such products they captured. Rum and sugar production go hand in hand, since rum is made of the waste products of the sugar manufacturing industry. Molasses – unrefined sugar cane juice – is fermented into rum. In approximately our period (about 1700) Barbados alone was producing approximately 467,000 gallons of rum a year. So that’s the basic situation. Pirates drank rum produced by sugar producers, captured ships laden with sugar and sold the sugar at a discount to merchants who had a ready market for it. Slaves – either escaped from sugar plantations or liberated by pirates from captured ships swelled the ranks of the pirates, and pirates dined in fine style on sugar products. In some instances, pirates even supported slave uprisings on sugar plantations. The situation in which a few lucky individuals owned most of the resources, and the vast majority of people owned little or nothing fueled the fires of piracy and stirred men into desperate rebellion. Sugar shaped the Caribbean, and the Caribbean shaped the pirates. This blog is great! I'm writing a book about pirates in a Fantasy world right now and learning what pirates actually did is helping alot. Thanks! This article is very helpful in enhancing our knowledge. Ecolo is providing the エコストロー that can reduce the environmental pollution.